Midway is now open. Today we have top to bottom skiing and riding on all 3 mountains with 4 lifts operating; Madonna I Lift, Sterling Lift, Mogul Mouse’s Magic Lift, and Sir Henry’s Glider. We have 65 trails open with terrain for all ability levels. 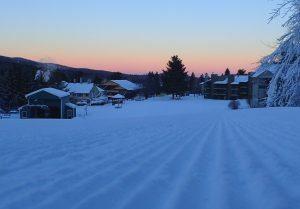 22 trails have been groomed for today, including Garden Path, Thomke’s, and Upper Drifter for a grand total of 91 acres of freshly groomed terrain. Most trails are covered with natural snow, so be aware and ski or ride with care. Surface conditions are packed powder and powder with average base depths of 20 to 50 inches. Last night we made snow on Lower FIS, Midway, Lower Madonna Liftline, and in front of the Base Lodge. We are presently making snow at the top of Morse, Midway, and Curley’s Cutback. Currently it is 0 degrees at the summit of Sterling with beautiful sunny skies and winds of 0 to 5 mph. Today’s forecast is calling for mostly sunny skies with a chance of snow showers late in the day and a high of 18 degrees.